Smoking tobacco from a waterpipe, also known as a hookah, accounted for over half of the tobacco smoke volume consumed by young adult hookah and cigarette smokers in the U.S., a new University of Pittsburgh School of Medicine analysis discovered. 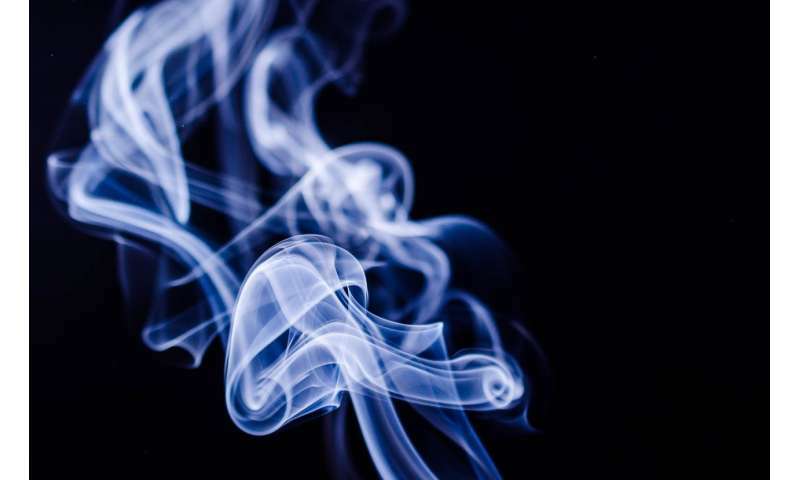 Toxicant exposures—such as tar, carbon monoxide and nicotine—were lower, yet substantial, for those young adults who smoked tobacco just using a hookah, compared to those who smoked both hookahs and cigarettes. The research, funded by the National Cancer Institute, is published today in the journal Tobacco Control. "Most hookah smokers in the U.S. are not daily users, whereas many cigarette smokers smoke multiple times a day, so it may seem that the vast majority of public health and policy-related interventions should be directed at cigarette smoking," said lead author Brian A. Primack, M.D., Ph.D., director of Pitt's Center for Research on Media, Technology, and Health, and dean of Pitt's Honors College. "What our research shows is that hookah smoking contributes significantly to the burden of tobacco smoke-related toxicants inhaled by our young people. Therefore, public health and policy efforts should explicitly address hookah smoking in addition to cigarette smoking." Primack and his colleagues analyzed data from 3,254 adults ages 18 to 30 who were randomly selected in March 2013 to complete a questionnaire about their tobacco use. The participants, who were from across the U.S., were 63 percent female, 17.5 percent Hispanic and 10.1 percent black. The study combined self-reported frequency and quantity of tobacco consumption information with estimates from previous studies of the toxicants associated with cigarette and waterpipe tobacco smoking. The survey results were weighted so that the findings would be more representative of the true make-up of the U.S. population. In the 30 days before completing the survey, about 1 in 20 participants reported hookah smoking, and about 3 percent reported smoking both cigarettes and hookah. Cigarette smoking was reported by 23.4 percent of participants, with most of them smoking close to every day of the previous 30 days. Whereas smoking one cigarette involves about 10 to 12 puffs, each containing a volume of 50 milliliters of smoke, one 45- to 60-minute hookah session can involve 100 inhalations of about 500 milliliters each. This is why smoke loads can be so large for hookah users, even if they use infrequently. Hookah smoking accounted for 54.9 percent of the smoke, 20.9 percent of tar, 10.3 percent of carbon monoxide and 2.4 percent of nicotine consumed by the participants in the previous 30 days. "Smoking tobacco from a waterpipe attracts young users because it is flavored and sweetened, done in a social setting and is often less irritating compared to cigarette smoking. Besides being a direct source of toxicants itself, hookah smoking has been linked to transition to cigarette smoking," said Primack. "All of this, combined with our new findings around the volume of hookah smoke consumed, should guide future efforts to prevent young adults from becoming hookah smokers." The authors note that more research is needed in this area, including comparisons of other forms of tobacco and nicotine use, such as cigars or e-cigarettes.